“Say cheese!” How many times you have heard this phrase and resisted the urge to give a big smile just because you feel embarrassed of your pale yellow teeth? Don’t worry! There’s no one judging you. The whiteness of your teeth can fade away due to various lifestyle reasons such as consumption of coffee, wine stains, smoking, among others. Nonetheless, it shouldn’t take away your right to smile confidently. More importantly, the New Year has just begun and you are going to create lots of joyful memories with your loved ones; and you deserve to smile without being shy. So what is that you can do to get that perfect smile? The answer is simple: Teeth Whitening. Start off your new year by treating yourself with a teeth whitening treatment and give your smile a rejuvenated new look! Here is why January is the best time to get teeth whitening! It will keep you Motivated! If your New Year resolution is to look better, you might have taken admission in a gym, started eating healthy, and changed your lifestyle to be more active. However, it will take months for you to see the results. 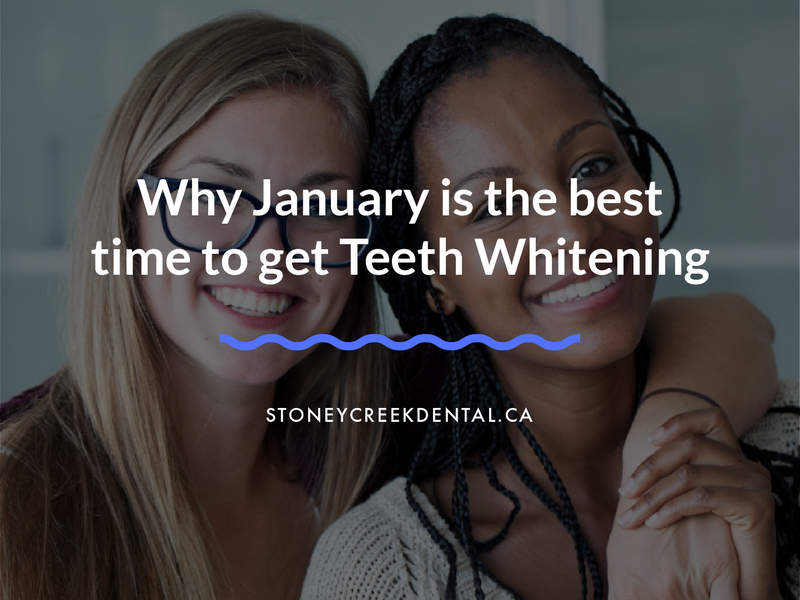 Opting for a teeth whitening at Stoneycreek Village Dentist will provide you with instant results, which will keep you motivated to improve yourself and remain persistent with your efforts towards a better version of yourself. New Year, A New and More Confident You! You might be looking to discover a new you. Perhaps a more assertive and confident version of yourself. Getting yourself an appoint at Stoneycreek Village Dentist for teeth whitening will help you to instill confidence, allowing you to communicate more effectively. You may realize that your entire body language has changed – for the better – as you don’t have to be cautious while you speak or laugh during a conversation. Also, you’ll look better in the photos as you will feel more comfortable flashing a big smile. When going out with your date on Valentine’s Day, you would like to look your absolute best! Our highly skilled dentists at Stoneycreek Village Dentist can help you get the perfect smile! A beautiful smile is one of the most attractive qualities that a person may look for in someone they wanted to meet! Perhaps all you need is a perfect pearl white smile to set up a second date? There are many people who choose to hide their beautiful smile instead of going for a teeth whitening treatment. You should not be one of them, especially not this year. Remember, it’s never too late, this is your time to shine! A single teeth whitening treatment can last year’s long allowing you to present a radiant smile with confidence. Visit Stoneycreek Village Dentist now and shine in the hallways by showing off your brightest smiles.